When others don’t recognize the image of God in my Muslim friends, don’t see them as equal to themselves, as someone who has much wisdom to teach them—I want to rage, I want to scream: how can you not see? I can forget that once I was blind too. That’s when the word they triggers something besides anger in my gut: conviction. I know I have blind spots, people I haven’t taken the time to know. Whenever I notice a bias rising up, a fear towards a certain group of people, an unhealthy generalization—I want to call it the sin it is and repent. I want to change it. For me, God began to shine a light on the glaring blind spot of labeling people by their religion in my college years. When I saw the pain in the hearts of my Muslim classmates in the wake of the September 11th attacks, I started to see people I’d chosen not to see before. I saw our shared humanity and I started to care because they became known to me. I’ve been intentional in this area. I got a degree in comparative religion, have studied Arabic and Bangla, lived in the Middle East and South Asia, visited mosques and temples, attended inter-faith dialogues, and built relationships with refugees in our area. And I’ve barely begun to learn. Islam, like all other belief systems, is a religious and cultural system, vastly diverse in the different communities where it is practiced. Just within the tiny country I live, Islam has so many complex identities I could spend a lifetime exploring them. But now some of those people are my people, friends I love. Long ago God identified a blind spot that my Christian identity had planted in my heart and blew it apart. But there are still many other biases I carry because of my race, gender, nationality, and yes—my faith. There are blind spots I am working to stare right into these days. There are others I haven’t become aware of yet; I know that. But I know these us/them places in our hearts lead us into fear when we don’t take the time to deconstruct them. 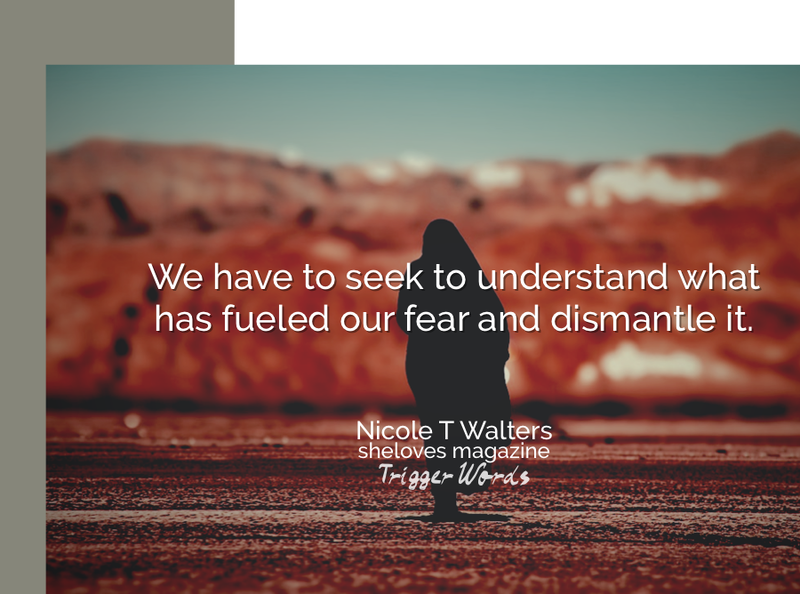 We have to seek to understand what has fueled our fear and dismantle it. If we are going to be those people—people who claim to follow the Creator of all, people who say they are stamped with the love of the Christ who gave his self for all—we cannot ignore these blind spots; we must not. These generalizations that lead to hate must trigger anger and conviction in us. They must cause us to change. They must plunge us deeper into the heart of Jesus who looks at all people and goes to every length imaginable to call them his people. I am a writer who lives somewhere in the tension between wanderlust and rootedness. I currently make my home in South Asia with my husband and two children but have left part of my heart in my Georgia home. I write to help people create space to listen to God, learn from others, and lead lives that love at NicoleTWalters.com. I have authored essays in several books and my writing has appeared in places like CT Women, Relevant, Red Letter Christians, and (in)courage. I am a regular contributor at here SheLoves Magazine and The Mudrooom and am a member of the Redbud Writers Guild.